"And the meteoroid's a bone thrown from the void, That lies quiet in offering to thee"
Glenn Miller is ranked 2nd best out of 5 albums by Glenn Miller on BestEverAlbums.com. 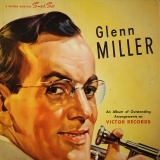 The best album by Glenn Miller is His Original Recordings which is ranked number 7780 in the list of all-time albums with a total rank score of 193. Members who like this album also like: Negroe Folk Songs by Leadbelly, The Voice Of Frank Sinatra by Frank Sinatra and And His Girl Friends by Frankie Carle. Paramount Center for the Arts - MN, Saint Cloud, United States. Greenwich Odeum, East Greenwich, United States. Sellersville Theatre 1894, Sellersville, United States. Related links: top tracks by Glenn Millertop tracks of the 1940s, top tracks of 1945. Showing latest 5 ratings for this album. | Show all 8 ratings for this album.